Last night, Domo and Pipkin spent time in Tsim Sha Tsui (locals call it TST) the neighborhood in Kowloon right on Victoria Harbour. 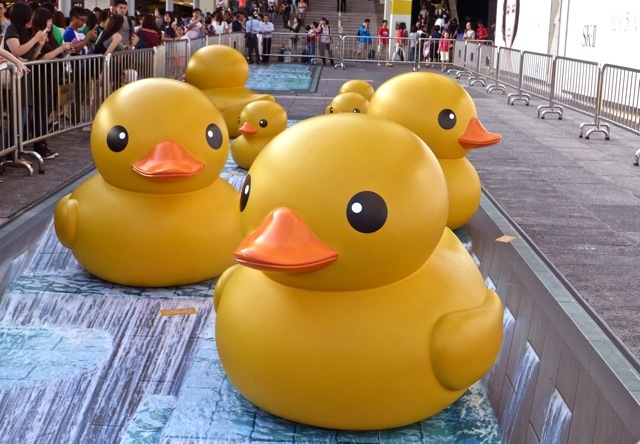 They saw Florentijn Hofman's giant inflatable duck floating in the harbour, and they got to take their photo with the smaller ducks on the pier. By day, the crowds are held back by metal gates, to allow visitors to see the trompe l'oeil waterfall painted under the ducks. 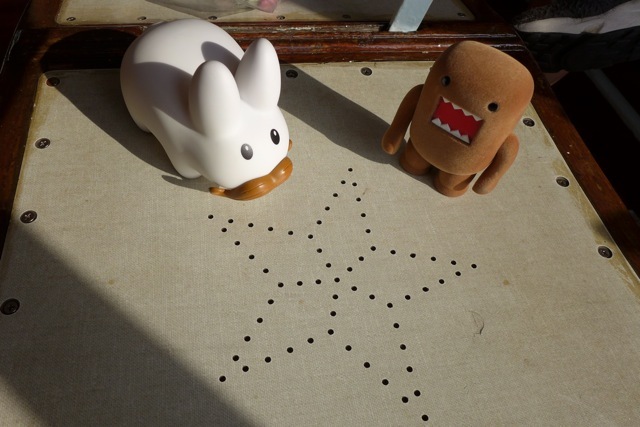 Domo practically had to tear Pipkin away from the ducks so they could board the Star Ferry to Central. Today they're going to take the tram up to Victoria Peak, and then hike up a little further to the peak peak. (The tram doesn't take you to the peak peak.) In the photo below, you can see Central and Victoria Peak behind all the buildings. 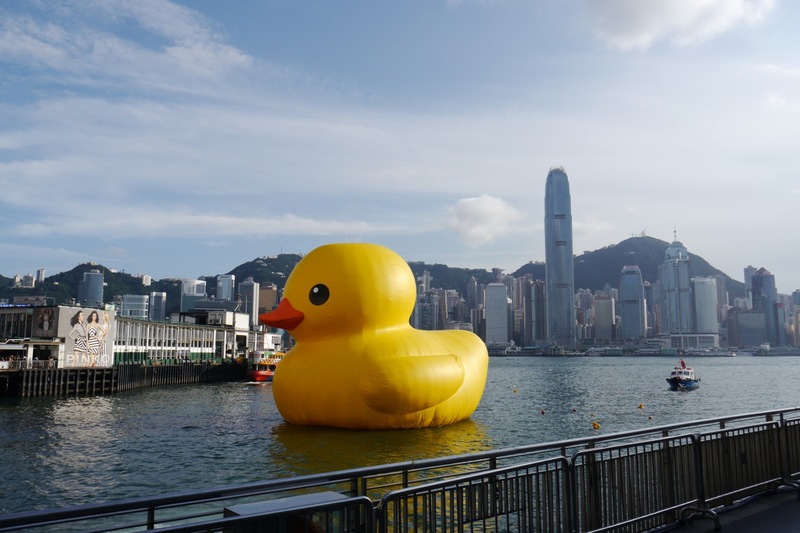 As close as Pipkin wanted to get to the giant duck, it's best viewed a little farther away so you can appreciate just how big he is. 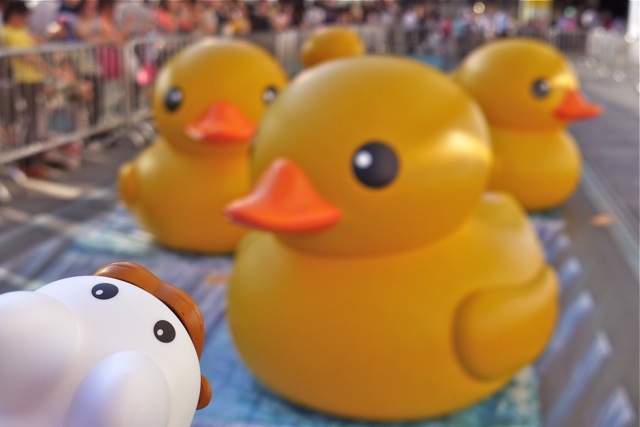 Look, he's got a smaller entourage of ducks around him! Still, Pipkin was a little wistful saying goodbye to the duck. There's something so friendly and familiar about the eyes, no? Ah, Pipkin must be thinking about his dear friend Dr. Duck, who moved from New England to Nebraska, where he now works at Rocky Mountain Bird Observatory. 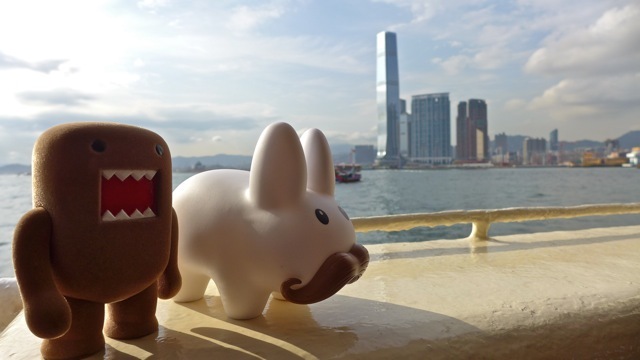 Pipkin and Domo swiped their Octopus Cards and got tickets for the ferry. Taking the ferry across the harbour between Kowloon and Hong Kong is very cheap and convenient, and the two really liked the Octopus Card. It's a prepaid, reloadable card that you can use for all mass transportation in Hong Kong: ferries, subways, buses, trams. Convenience stores, some fast food chains, parking meters, photo booths, parking lots, everything accepts payment from this convenient swipe and go card. Everything, that is, except for taxis. No matter. Hong Kong is very fun and walkable, so walking from their hotel in Jordan to the Star Ferry terminal provided them with a day time perspective of TST. On the Star Ferry, they flipped the backrest so they could face the direction they were going, and took a seat on the star punched chairs of the lower deck. On a beautiful clear morning such as this, you can stand out in the breeze and take in views of the harbour as you cross. 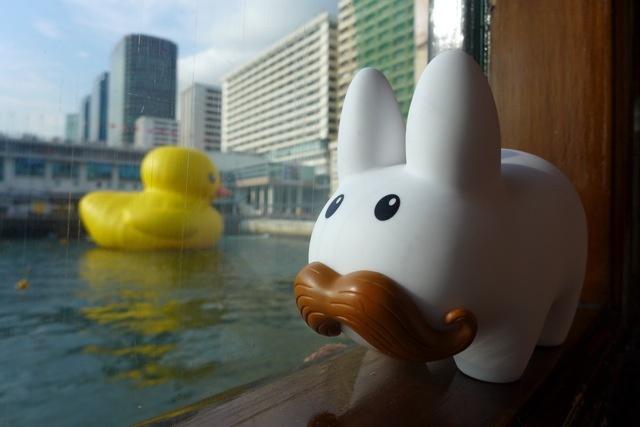 Pip and Domo watched the ducky get smaller and smaller as they sailed across to Central. Dr. Duck wishes he could have tagged along to see the giant ducks with Pipkin. There's lots for a little duck to see and explore out here in Nebraska, but somehow not quite as much fun on one's own. Pipkin will have to visit and Dr. Duck and he can ride bikes and see everything there is to see!